Seitan is one of my favorite vegan protein sources. It has a delicious meaty bite and taste, and if you can find a cheap source of vital wheat gluten, it is also extremely affordable. It is very versatile and can be made into lots of different varieties and flavors, form a simple basic meaty seitan like the one in the picture, to sausages and burgers. 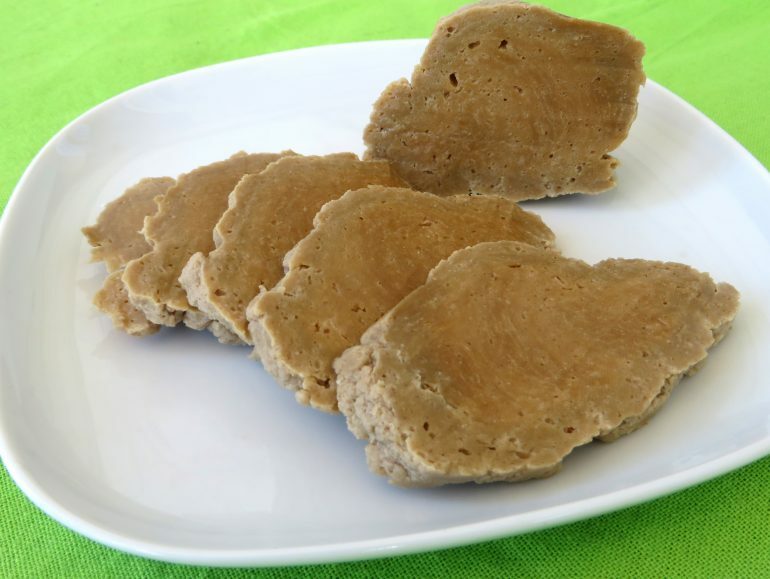 The vital wheat gluten flour itself is quite low in carbs, so as long as you only add low carb ingredients such as soy sauce, spices, tofu or protein powder, the resulting seitan will also be low in carbohydrates. In this recipe which is based on Isa Moskowitz' famous PPK seitan, I only add a bit of nutritional yeast, soy sauce, garlic and vegetable bouillon. Depending on the exact nutritional values of your ingredients, the whole recipe has about 25 g net carbohydrate and 120 g protein. There are about five servings in this recipe, so that's 5 g net carbs and 24 g protein per serving. Seitan can be a little temperamental and there is a bit of a learning curve to making it, so don't give up if you don't get a perfect result right away. I've tried to make the instructions as clear as possible. You can cook the seitan a few different ways. It's easier to get a nice firm texture with steaming or baking, but simmering can give you the lovely dense and tender tofu in the picture if you master it. Just make sure the dough on the dry side and take the time to properly knead each piece before putting it in the broth. This recipe makes about 400 grams of seitan, which is 4-5 servings. When I do meal prep, I like to make a double or triple batch and freeze most of it. A large batch like that is only a little bit more work. It lasts us up to a month and it's a really a nice way to always have a cheap source of delicious protein on hand. It is a very versatile meat substitute that tastes food in stews and stir fries, but can also be breaded or made into shawarma or gyros. You only need this much broth if you're simmering the seitan. If you steam it, you don't need any broth. If you want to bake it you only need enough to create a shallow layer in your casserole dish. Mix the wheat gluten and nutritional yeast in a bowl. Add the water, soy sauce, oil and garlic and mix with a fork until it starts to form a ball of dough. Knead the ball for a minute or two to incorporate all the flour. Add a little water or gluten if the dough is too dry or wet, but try to keep it on the dry side. Je can now divide the dough into two to four pieces that you shape into balls or cutlets and cook by simmering, steaming or baking. I usually make two or three balls which I cut into slices after they're cooked. Knead and shape each piece of dough by folding it over a few times and letting it rest a little while for the best texture. Then cook the seitan according to one of the methods below. Heat the broth in a large pot. Add the pieces of kneaded seitan, and keep it on a very low simmer for about an hour until the seitan is done and floats to the top. For the best texture it is important that the water does not bubble at all during the entire cooking time, so the simmer should really be very very low. Let the seitan cool in the broth or take it our right away if you like it very firm. The broth tastes really good, so use it as a base for a soup or stew or reconstitute some tvp in it. Bring water to a boil in your steamer pot. Put the pieces of seitan dough in the steamer basket on some parchment paper to keep them from sticking. Cover with a lid and steam for 35-40 minutes. Let the seitan cool in the steamer. Preheat the oven and a casserole dish to 160 C /320 F. Pour a shallow layer of warm broth into the dish and put the seitan pieces into it. The seitan should be half covered in broth. Bake for 30 minutes, turn the seitan pieces over and bake them for another 20 minutes. Let the seitan cool in the steamer. Thanks for this page. Great work! Thank you Joel! I'm glad you find it helpful. Hi Brian, it's mostly for flavor, so feel free to substitute. You may want to add a little soy flour or protein powder to help with the texture. Hi- this tastes delicious but it wouldn't stay in the shape of a ball and kind of fell apart while simmering. What do you suppose I did wrong? Also, I'm putting this in my food tracker so what do you think is the approximate amount of fat per serving? Thanks!! Hi Katie, did the broth bubble during cooking? It should be hot, but completely still, otherwise the bubbles will destroy the seitan. Also, are you sure you used the right kind of flour? It should be at least 70% wheat gluten. I was wondering if you had the nutritional information for this recipe? Hi Beverly, the exact nutritional value of this recipe depends a lot on the ingredients that you use. Especially the values of vital wheat gluten can vary quite a bit. If you need to know the exact value, you're therefore best off calculating it yourself. If precision is not an issue, you can just enter it as generic 'seitan' in your food diary software.